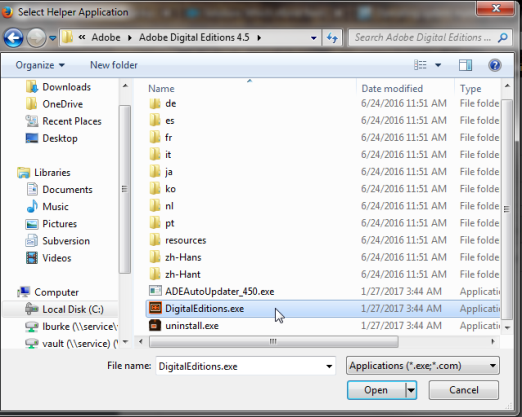 If you're having trouble opening downloaded ebooks through Firefox, you'll need to make sure Adobe Digital Editions is the default program for opening ACSM files (which are the download files for ebooks). If you're having trouble opening downloaded audiobooks through Firefox, you'll need to make sure OverDrive's desktop app is the default program for opening ODM files (which are the download files for audiobooks). Use the steps below to make Firefox open the download files (ACSM or ODM) with the correct program (Adobe Digital Editions or the OverDrive desktop app). Open Firefox and click the Menu button near the top-right corner, then click Options. Click the Applications tab from the left-hand side. If you're having trouble downloading an ebook, type "Adobe content" (or "ACSM") into the search box and select Adobe Content Server Message (or acsm file). If you're having trouble downloading an audiobook, type "OverDrive" (or "ODM") into the search box and select OverDrive Media File (or odm file). Once you've selected the correct program, try downloading a title using Firefox again. If it opens in the correct program, there's no need to continue with these steps. If you don't see Adobe Digital Editions or OverDrive for Windows listed, click Use other... and continue to step 5. In the "Select Helper Application" window, double-click OverDrive for Windows for ODM files or Adobe Digital Editions for ACSM files. Once you've selected the correct program, try downloading a title using Firefox again. If it opens in the correct program, there's no need to continue with these steps. If you don't see Adobe Digital Editions or OverDrive for Windows listed, click Browse.... and continue to step 6. After browsing to the correct directory, double-click digitaleditions or mediaconsole. Once you've selected the correct program, try downloading a title using Firefox again. Open Firefox and click the Firefox drop-down menu in the upper-left corner, then click Preferences. If you're having trouble downloading an ebook, type "ACSM" into the search box, and select ACSM file. If you're having trouble downloading an audiobook, type "OverDrive" into the search box, and select ODM file. If the correct program isn't already selected in the "Action" column, click the drop-down menu and select the appropriate program (if listed). Then close out of the "Applications" window and try downloading the title again. 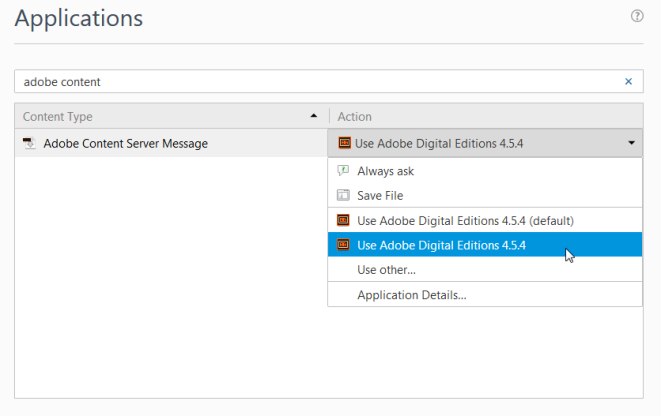 If you don't see Adobe Digital Editions or OverDrive Media Console listed, continue to step 5. Click Open. Back in the "Applications" tab, click the red X in the top-left corner to close the window, then try downloading the title again.